Wario Land II is a game by Nintendo that was released in Western regions for the Game Boy in March 1998. This is the second installment of the Wario Land series (third counting Virtual Boy Wario Land). It is a 2D platformer starring Wario, the greedy treasure hunter, who was also the protagonist of the series' first game Wario Land: Super Mario Land 3. While the game was originally released as a Super Game Boy-enhanced title outside of Japan, a version adding Game Boy Color support was released in Japan seven months later as one of the October 1998 launch titles, featuring colored sprites and backgrounds. This version came out later in Western regions as well. A successor to the game was produced and released in 2000, namely Wario Land 3, which adapted most of this game's gameplay mechanics. 4.2.2 Chapter 2: Go to the cellar!! 4.2.5 Final Chapter: Mysterious Factory! The story begins at Wario Castle. There he lies at his bed, taking a deep nap. However, three shadowy figures approach the castle from outside. They are Pirate Gooms, loyal minions of Captain Syrup and members of the Black Sugar Gang. The pirates infiltrate the building and steal Wario's treasures, which he collected during his earlier adventures. To distract Wario and prevent him from chasing them, the pirates cause havoc in the castle by turning on a giant faucet, abandoning a vicious snake in his cellar and installing an oversized alarm clock. After this, the pirates escape and leave Wario in the mess they caused. Wario eventually wakes up by the alarm clocks's commotion and sets off to pursue the thieves, but not before rectifying the state of things in his home. During his pursuit of the pirates, Wario learns that the fleeing bandits have scared his pet hen away, so he ditches his quest for a brief moment to rescue his beloved pet. He resumes the pursuit after the hen is safe again. Wario manages to get to the pirate's ship before they can set off. He drops the anchor, so the ship is forced to halt, but is then stopped by the ship guard Bobo, who delays his progress so the pirates can escape via a hot-air balloon. Wario chases them through the overgrown jungle of Maze Woods and a city with an unknown name. Wario eventually arrives at Syrup Castle, the hideout of the mischievous pirate gang. Horrified that the pirates managed to return to their fortress, he continues his pursuit and breaks in the building. After battling many of the pirate grunts and four ducks, Wario confronts the pirate leader herself in combat. After defeating Captain Syrup and demolishing her aircraft, Wario blasts the pirates out of their fortress, reclaims his treasures and returns home to resume his nap. The game also features alternate pathways and alternate endings, but they generally end with Wario safely back at his castle and his treasures returned. Eventually in the true final chapter (which contains a Time Attack feature), Wario returns to Syrup Castle and proceeds to a mountain range somewhere near the building. There he discovers a secret cave in which the pirates store their treasures. In a final raid, Wario overcomes the difficulties in the pirate cave and plunders Syrup's riches. He then returns home for the final time, but not without the giant spear man following him closely. The pirate's motivation of doing so is unclear. Wario Land II is a 2D platforming game, like its predecessor Wario Land: Super Mario Land 3. It is divided into five worlds (called Chapters), which each are divided into five respective stages (called Stories). The chapters are accessed one after another, so when the player completes a level, they will be instantly transported to the next level. However, after completing the game for the first time, the player will receive a Treasure Map which allows them to choose the level they visit at will. The game is notable for its branching storyline. Throughout the levels, the player can discover many secret exits which lead to five additional Chapters. Five different endings can be unlocked in this way, not counting the real ending that is accessed after completing the unlockable Time Attack level. Wario, using his Dash Attack. Wario's primary abilities remain the same as in the previous game. The player can walk, crouch, and enter doors with the , jump using the Button and perform Wario's signature Dash Attack by pressing the Button. If the is pressed up while jumping, Wario will jump slightly higher. The Player can use this technique while jumping on an enemy to jump even higher. When standing on a slope, pressing down will cause Wario to perform a rolling attack, that can smash blocks and defeat enemies. Unlike earlier, Wario can now use a Ground Pound to create shockwaves even without using a Viking helmet. This can be used to reverse enemies' movement, as well as to defeat them. When Wario stuns an enemy by jumping on it, he can pick up the motionless foe and carry it around. Wario's speed will decrease while he is carrying a heavy foe (e.g. a Grunt, or a D.D.). A carried foe can be used to defeat other foes by throwing it on them. The player can now also power up Wario's throw by pressing and holding the Button. This will increase Wario's throwing distance and also instantly defeats the tossed enemy if it hits an obstacle. One of the most prominent features in Wario Land II is Wario's immunity against death. Being hit by an enemy only causes him to be briefly knocked backwards and lose some coins. In addition, some enemies cause Wario to assume new forms which the player can use to progress through the level. While eleven conditions (later renamed "reactions") can be used to gain advantages, they may sometimes act as a hindrance, depending on the situation. Most conditions are curable if Wario touches a body of water, but some only wear off after a certain amount of time has passed. Wario Wario's normal form. In this state he controls normally, he can execute his trademark attack, smash the ground, pick and throw enemies, etc. While virtually invincible, Wario will recoil some steps back and lose coins in the process if he takes damage, which could be a hindrance sometimes. Ball ni naru When jumped on by Dunk, Wario becomes a ball. If grabbed, he will be used to score a point, which will revert him to normal if he is still in the basketball game. He can slowly move left or right while bouncing, and can also touch one of Dunk's basketballs to revert to normal. Likewise, Wario can inflict the same effect on Dunk. Bouncy Wario When getting hit by an Ape's mallet, Wario transforms into a spring-like creature and bounces around, which can be used to reach higher levels. After a while, the effect will wear off. Bubble Wario By touching a bubble that emerges from a hole under water, Wario will be trapped in the bubble and float upwards. In this form, Wario can pass currents that would reject him normally. Hitting a ceiling or the surface will end this condition abruptly. Crazy Wario A useless condition that is evoked by ball-throwing Penguins in the English version. In this state, Wario will stumble around and controlling him is much harder. When the player presses the Button, Wario will exhale a cloud of poisonous gas. Touching water will restore his senses. In the Japanese version, this form is dubbed "inebriated" and the Penguins throw beer rather than balls, but the behavior is identical. Fat Wario When Wario eats one of Cook's cakes, he will turn fat and his jumping skills will decrease massively. While being obese, any enemy that comes in contact with Wario will instantly be defeated. The effect wears off after Wario moved around enough. Flat Wario Being smashed by a Bat's grindstone will cause Wario to get flat. In this state, he cannot attack anymore, but can glide through the air and fit into small holes. To assume his normal form, Wario has to touch water or use a bat without a grindstone. Frozen Wario When hit by a Snowman's chilling breath, Wario will be covered in ice and slide backwards until he hits a wall. Every enemy in his way will be defeated. Hot Wario When getting burned by a Flame's torch, Wario will be set on fire and he will run around panicking (similar to Mario running around with his overalls on fire from Super Mario 64). After a while, the flames will spread over his whole body, transforming him into a wandering fireball. In this state he can break certain blocks. The condition ends when Wario touches water or is burned to ash. Puffy Wario Getting stung by a bee will cause Wario's head to swell to enormous proportions. He will float upwards like a balloon (similar to Balloon Mario from Super Mario World) until he hits a ceiling. This can be used to reach higher locations. Tiny Wario When being cursed by a Wizard's magic, Wario will transform into a dwarf. In this form, he fits through narrow holes and can jump higher. Touching water or suffering a hit from an enemy attack will revert him to his original form. Zombie Wario After suffering a bite from an undead, Wario will become a zombie. Unlike his normal form, Zombie Wario cannot jump anymore, but he is impervious and will defeat any enemy upon contact. He can also fall through thin floors and thereby reach locations he cannot enter by normal means. Being exposed to light will change him back to his old form. Like in every installment of the Wario Land series, the player can obtain various optional treasures during Wario's adventure. The kinds of treasure that can be found in the game are composed of different artifacts, seemingly useless junk, strange oddities, and even references to other Nintendo series. To obtain a treasure, a coin-consuming mini-game must be completed. There are two different categories of treasures in the game, each having 50 parts, making 100 obtainable objects in total. Once all the treasures are collected, the player will gain access to the game's final stage, as well as to a remake of the Game & Watch mini-game Flagman called Flagman D-D. Treasures are items that are hidden somewhere in the games levels. Each story has one of these, making a total of fifty treasures in the game. The treasure can be obtained by playing a mini-game behind the respective treasure door. Before the matching game can be played, the player has to pay a certain amount of coins. The price for one try depends on the difficulty mode that is chosen at the beginning of the game, so the amount of necessary coins vary between 50, 100 and 200 coins. After the preparations are set, a lock will float down from above and attach itself to the treasure chest. The lock shows a picture of an enemy. After that, eight panels will be displayed in the lower half of the screen. The panels will turn around for a short time, showing pictures of various enemies. Then after a moment (the duration of the moment depends on the earlier payment) the panels will turn around again. The player has to choose the panel that shows the same enemy as that on the chest's lock to open the chest and receive the treasure. If the player makes a wrong decision, the game is forfeit and it has to be played again (at the full price). The Picture Panel is a panel of 50 Picture Pieces that, when completed, forms a treasure map that reveals the secret entrance to the pirates' treasure cave. One piece of the Picture Panel is hidden at the end of each of the game's levels. The player has to play a mini-game to obtain the prize. The Number-matching game is a mini-game mainly composed of nine panels, arranged in a 3x3 pattern, facing to the ground. When turned around, they form the shape of a digit, which can be any digit from zero to nine. The player has to guess which digit is displayed on the panels to obtain the treasure. By paying 50 coins, they can make one of the nine panels turn around. The respective panel will be chosen at random. When the player wishes, they can make a guess. If the guess is right, the chest will open and release a piece of the Picture Panel. If not, the mini-game is forfeited and the player will have to replay the whole level in order to get another chance. After beating the game for the first time, the mini-game will slightly change. The panels will now turn around automatically, while Wario's number of coins is steadily decreasing. This leaves the player with less time to think and makes the mini-game more fast-paced. The player can turn it back to the original before the game starts by hitting . Wario Land II is notable for its multiple storylines and many hidden Chapters. Story 1: Turn off the alarm clock! Story 2: Turn off the giant faucet! Story 3: Let the water out! Story 2: Escape from the woods! Story 4: Drop the anchor!! Story 3: Through the thorny maze!! Story 5: Defeat the giant bee! Story 1: Stop that train! Story 2: Up on the rooftop!! Story 4: Escape from the factory! Story 5: Anyone for B-ball? Story 1: Get to the Castle!! Story 2: Storm the castle!! Story 3: Defeat four ducks! Story 4: Find the hidden door!! Final Story: The Final Battle!! Secret ways to complete levels that alter the story can be found in many places. Story 1: To the castle!! Chapter 2: Go to the cellar!! Story 2: Avoid the rocks! Story 3: Stop that train! Story 4: Find the exit!! Story 5: Defeat the cave master!! Story 1: Escape from the Tea Cup! Story 3: Inside the ruins! Story 4: Escape from the ruins! Final Story: Capture the ghost! To complete the game with 100%, the player needs to unlock all of the chapters and find the treasures. Story 2: Into the factory! Story 3: Move through the water! Story 4: Don't shock the owl! Time Attack: Steal the Syrup's treasure!! Giant snake A giant snake that was abandoned in the basement of Wario Castle. It attacks by biting and can turn Wario into an egg. Bobo The guard of the SS Tea Cup. He attacks with dive attacks and uses strong wind gusts to blow Wario away. Giant bee A savage bee of abnormal size that can sting Wario and summon smaller bees. Dunk An anthropomorphic bunny that is proficient in ball games. Wario engages him in a match of basketball. He can turn Wario into a ball and slam dunk him. Cave master A bulky pig-like creature that attacks by shoving Wario around and tries to kick him out of the battlefield. Big Kamukamu A fish that lives in the flooded ruins of an ancient civilization. It will try to devour Wario. Awabō An inflated enemy who captured Captain Syrup. He tries to surround Wario in a bubble and make him float away. Ghost A phantom, haunting a remote mansion. He attacks by swooping down and tries to grab Wario. Captain Syrup The main antagonist of the game, who stole Wario's treasure. She can be battled many times in different crafts during the game. Mecha Kuri A massive robotic foe. Controlled by Captain Syrup, the robot rampages and tries to catch Wario with his rake. Giant spear man A persistent boss who appears in many levels of the game. He is also the boss of the actual final stage. Alarm clock An alarm clock that was deposited at Wario Castle to delay his progress. Ape Hammer-wielding apes that try to smash Wario. A hit will transform him into Bouncy Wario. Bee An aggressive bee which stings Wario, causing his head to swell to a ridiculous size. Bird A small bird that attacks as soon as it spots Wario. Chūta A rodent that emerges from mouse holes and attacks by bumping into Wario. Cook A mole-like creature that wears an apron and throws cakes. Its cakes make Wario fat. D-Bat Flying creatures, some of which carry heavy grindstones which they drop at Wario to flatten him, while the other bats try to grab Wario and can cure the flat status. D.D. A member of the Black Sugar Gang. It wields a boomerang in battle. Eel An aquatic creature that grabs Wario and pulls him down into the currents. Flame A fox that is armed with a burning torch that can light up Wario. Gaugau Members of the Black Sugar Gang which throw bottles at Wario. Ghost A ghost that lives in dark places and turns Wario into a zombie upon contact. Grunt An ape-like creature that carries large iron balls with spikes. It will throw them at Wario once he gets near. Gugi A mollusk-like creature with a tendency to sleep a lot. It attacks in a frenzy when waken up. Inamazu A walking fish that produces electricity in its antennas. It will shoot lightning at Wario. Kamukamu A Game Boy-exclusive enemy replaced by sawfish in the Game Boy Color version. It attempts to hold Wario in its maw and chomp his coins away. Kotsuheri A helicopter-like object with an imprinted skull. They float in the air and block Wario's path. Pecan A pelican wearing a pirate's bandana that spits spiky fishes at Wario. Penguin Foes who toss an orb (or a mug of beer in the Japanese version), which causes Wario to become dizzy. Pirate Goom A common type of enemy that wields a trident as a weapon. Punch A foe that is armed with boxing gloves. It will try to punch Wario off platforms. Rooster A chicken that lives in Wario's chicken pen. It attacks only when it is touched. Sawfish Aquatic creatures that have spikes attached to their noses. They dash at Wario when they see him. Tobī A flying fish that leaps out of the water like a Cheep Cheep. Togemen A spiked creature that jumps around. Its belly is its weak spot. Tsuriuo A fish with a fishing rod that uses a fake coin as a decoy to trick Wario. White puff A strange, blob-like creature that will inflate upon contact, blocking the way. Wizard Two Pirate Gooms wearing a wizard's robe. They can shrink Wario, using a magical rod. Yukimaru A living snowman that will try to freeze Wario with its icy breath. Zombie An undead creature which can turn Wario into a zombie with one bite. Coin Coins are used to pay the mini-games that must be won to obtain a treasure. 10 Gold Coin A golden coin with Wario's face on it. It is worth 10 regular coins. Giant Coin A rare flashing coin that randomly appears when defeating an enemy or breaking a block. It is worth 100 regular coins. Brick Block These come in various forms and sizes, depending on the level. Wario can break them with any attack. Enemy Block These blocks can only be broken by throwing an enemy at them. They are sometimes disguised as normal walls. Bonfire Block Only Hot Wario can break these while in his flame state. Weight Block A block with cracks in it. Only Fat Wario's massive weight can break them. Switch Block Switches that trigger various events. The effects range from switching lights on to moving blocks. Glass Block A special kind of block that appears in Level 5-3. It can be picked up and thrown like an enemy, but will break when touching the ground. Stove Stoves like that can be found in many different areas. They can be moved by ramming and used as stepping stones to reach higher locations. Elevator A platform that connects two floors. It will move in the direction the arrow is facing. If the arrow is pointing down it can only be activated by Fat Wario. If the arrow is pointing up it can only be moved by normal Wario. Conveyor Belt It moves in a certain direction and will affect Wario's movements. When crouching it is impossible to move against its direction. Blade A sharp Blade that launches itself in the air in a set rhythm. Only the tip is dangerous, so Wario can slip underneath it while it is risen. Spike Floating obstacles with thorns. They are usually found in levels featuring the owl. They change their appearance depending on the area. Sometimes they are electric. Spikes Spikes that are usually found embedded in the ground. Wario will lose coins when touching them. Hen The hen is Wario's beloved pet chicken. She plays an integral role in stage 2-1. Albatross A harmless bird that appears in some levels. Wario can use them as platforms to reach remote locations. Touching them will cause them to fly away. Owl A sleepy owl that appears in some levels. When awakened, it can carry Wario around. Turtle A sea turtle that can be found near water. It helps Wario by carrying him over strong currents. For this subject's image gallery, see Gallery:Wario Land II. Super Mario Land 2: 6 Golden Coins - The scenario where Wario is booted out of his own castle by the Pirates (and the ending to that scenario) was very similar to the plotline of Super Mario Land 2, right down to the front of the castle having the emblem removed and placing the Syrup Pirates logo over the front. Ironically enough, it is Wario who gets booted out of his own castle and has to get it back while in Super Mario Land 2: 6 Golden Coins, it is Wario who was the one who stole Mario's Castle. Wario Land: Super Mario Land 3 - Syrup Castle and the SS Tea Cup originated from this game, as well as an early form of Wario Castle in the second-best ending. Virtual Boy Wario Land - A treasure that looks like a Viking helmet as it appeared in this game can be found in the very first stage. Super Mario Bros. - A piece of coral can be found as a treasure in Chapter 3, Story 3: Inside the ruins! Yume Kōjō: Doki Doki Panic - A Big Face (revised as a Turtle Shell in Super Mario Bros. 2) can be found as a treasure in Chapter 3, Story 4: Escape from Maze Woods. A Crystal Ball (found in both titles) is also a treasure in Final Chapter, Story 3: Defeat four ducks! Dr. Mario - A Megavitamin can be found as a treasure in Chapter 2, Story 1: To the castle!! Super Mario World - A Yoshi's Egg can be found as a treasure in Chapter 2, Story 3: Defeat the giant spear man. Wario Land II generally received good to excellent ratings, and many reviewers agree that it marked a milestone in the genre of 2D Platformers. IGN.com praised the game's innovative gameplay, its replayability, and its continuous gameplay, and even though it criticized Wario's inability of running out of lives, the game received a rating of 9.0. GameSpot mentioned its branching storyline, especially highlighted the updated graphics of the Game Boy Color version, and rewarded the game with a 8.9. 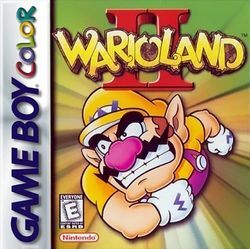 Gaming Target criticizes the fact that Wario Land II provides the player only with one save slot and some other save-related issues, but also calls it an "essential game for every GBC owner". Gaming Target reviewed the game with a 9.0. Nintendojo.com rated the game 9.0 and called it "A unique and addictive platformer that no gamer should be without". Overall, Wario Land II received 88.04% on GameRankings.com. Game Boy Color Marcel van Duyn, Nintendo Life 9/10 "Big fans of the first game might lament Wario Land II's sudden significant change in gameplay, but if you give it a try, you'll find that it's actually quite good. All the unique new gameplay features help flesh the series out and turn it into a wildly different, yet still equally entertaining game, which should be checked out by both those who liked and disliked its predecessor." Game Boy Color Alec Matias, IGN 9/10 "Wario Land II is another reason why Nintendo is best at creating entertaining platformers. It has been a while before a game had me craving for more and Wario Land II had me doing just that. It's the perfect game to accompany you on a long road trip because of its lastability and replayability. I can honestly recommend this to anyone and everyone." Game Boy Color Rudy Lavaux, Cubed3 9/10 "Wario Land II has quite a few good things going for it. Its excellent gameplay, varied environments, good graphics and sound (for the time), and its impressive selection of transformations and puzzle elements make it easily one of the best Game Boy games ever conceived. Admittedly it doesn't hold a candle to the inventiveness of its successor and the excellent gameplay, graphics and sound of the Game Boy Advance episode. With that being said, it's still a must-have classic for any Nintendo fan. The drastic change in gameplay, taking the franchise farther away from its Mario roots might not be to everyone's taste, but ultimately turns out an excellent choice that gave the series nowadays most of its unique personality, even though we quite loved the gameplay with the different hats." Both versions of Wario Land II were directed by Hosokawa Takehiko and produced by Izushi Takehiro. Yamanaka Masaru served as the main programmer on both versions as well. Wario Land II was originally scheduled to be released in 1997. A screenshotMedia:WL2 Beta 1.png released in that year depicts an unknown underground area with broken ledges not seen in the final game. In addition, the chain of the grindstone carried by the D-Bat was longer than any chain in the released version. Breakable jars were also found in the underground area, which is not the case for similar places in the final version. The amount of Wario's coins is also not seen in the screenshot. The game manual incorrectly states that Wario is unable to jump while in his flat form. This is the first game which depicted Wario as wearing a short-sleeved shirt. The Japanese release of Wario Land II came with two black decals shaped like Wario's mustache. Many of the game's treasures are references to other Nintendo games and franchises, like Yoshi, The Legend of Zelda, and Metroid. This is the first Wario Land title to not feature Gunpei Yokoi in the main staff due to his death a year prior to its release. The theme for the matching game and Number-matching mini-games is borrowed from the Game Boy Donkey Kong. ↑ Wario Land II: Frequently Asked Questions. Nintendo.com (June 10, 1998 snapshot via WayBack Machine). Retrieved October 22, 2018. This page was last edited on April 24, 2019, at 18:51.